Types of Camellias — Camellias Victoria Inc.
At least three different species of camellias are categorised as sasanqua camellias. This group of camellias is the first to bloom, starting from March and continuing to July with a few cultivars going much later. They are typified by small, dark green leaves (up to 7cm long and 4cm wide), flowers can range in size from 3 to 10cm in colours from white, pinks to burgundy. Most of these flowers shatter easily, lasting only a couple of days on the bush but they are borne in such profusion that there is a continuous display for long periods. At maturity plants range in size from medium shrubs to small trees and can vary from tight upright growth to a loose, weeping habit. These plants are versatile and can be used in hedges where they can be clipped to size, espaliered on fences, grown in the open garden where they are quite sun hardy, grown as container plants and recently ground cover plants have been developed. 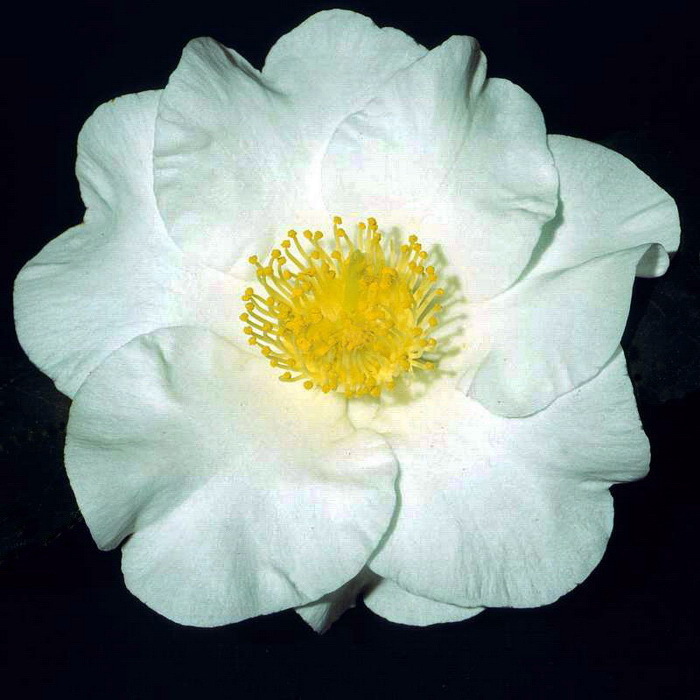 This single species of camellia includes most of the cultivars grown in gardens today, and this type shows the widest range of flower form, colour and size which can vary from miniature to large. It is also a very adaptable camellia. Given the right cultural conditions it will thrive in any mild climate, and it can tolerate short periods of temperatures ranging from below 0ºC to above 40ºC without showing any ill-effects. Some camellias of this type may grow from 10 to 15 metres in height but they will withstand heavy pruning if smaller plants are required. Even without pruning the large size is only achieved after a considerable period of time as most cultivars only grow 15 to 25cm per year, which means they can often be grown in tubs for many years. Japonica camellias are generally distinguished by attractive shiny, dark green, dense foliage throughout the year. The leaves are normally 7 to 15cm long and 5 to 9cm wide. Some cultivars of this species commence flowering in April, reaching a peak from mid-August through to mid-September. Most finish during October but a few continue flowering until late November. Most cultivars flower over several months. Some japonicas have an unstable genetic makeup making them prone to mutation and visible changes known as "sporting". When this occurs a plant spontaneously produces some flowers which may be quite different in form or colour to those normally expected. Some camellias are renowned for this tendency and whole families of related camellias have developed in this way, examples are 'Aspasia Macarthur', 'Betty Sheffield' and 'Elegans' each of which has produced numerous sports, many of which have been grown on and recognised as new varieties. The attractiveness of reticulata camellias stems from their very large showy flowers. Originally in colours of pale pink to deep purple-red, new white and pale bi-colour varieties have been bred. The growth habit of the original reticulatas is generally fairly open and somewhat woody with leathery, dull green leaves. Newer reticulata hybrids have improved the growth and foliage while still retaining the beautiful blooms of the original species. The new foliage of many cultivars is an attractive pink/burgundy shade, and once fully grown the leaves are large, being 10-18cm long and 5-9cm wide. Mature foliage is normally dark green and hard, with heavy venation sometimes being apparent. Reticulata camellias are typically trees of up to 10 to 12 metres in their natural habitat. Young plants can grow in excess of 50cm per year, but older plants generally show much slower growth rates. Pruning can be carried out, however, it is probably best to cut back to a growth bud or another branch. Growth requirements are similar to those of japonicas, but large reticulata blooms are more prone to damage in windy positions. With peak flowering in August/September, they are normally finished by late October. Hybrids offer us the biggest breakthrough in obtaining tough, colourful and soil tolerant plants. The term "hybrid" is reserved for the progeny of crosses between two different species and this has resulted in some of the prettiest flowers we have today. In addition to the reticulata hybrids mentioned previously, we have an expanding group of plants containing crosses with different camellia species to produce plants with many desirable traits including wide temperature and soil hardiness, fragrance, different colours and new growth habits. Cluster flowered hybrids with small flowers and a profusion of buds borne up the stems and a long flowering period have greatly expanded the range of camellias available. This group of camellias includes types which are unchanged from their natural form. They are the native plants of a number of countries in Eastern Asia. There are almost 300 different species described but a large number have not been introduced into Australia. Most produce very small flowers which are white or pink in colour, although some species have yellow flowers and a few produce large blooms. Some are highly perfumed. It is these species which are being used to breed fragrant and new coloured camellias for the future. Some species camellias are popular as attractive and unusual garden or tub specimens, they can flower over several months and show a wide diversity in foliage, flowering and growing habits, the perfumed species being particularly desirable. Many will flourish under the same conditions as the camellias previously described, but some species are more particular and specialist advice is advised.